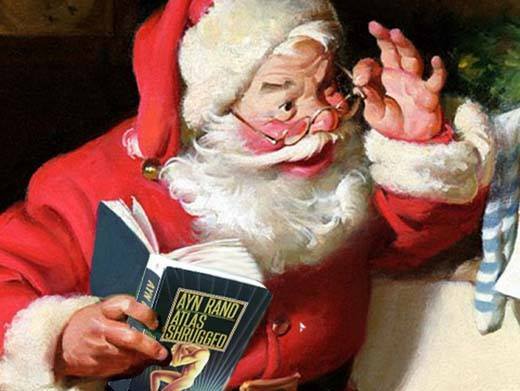 Not PC: The Reason for the Season: Capitalism? The Reason for the Season: Capitalism? In this guest post, B.K. Marcus tells some of the little-known tale of how capitalism created the modern Christmas, and the market innovation of Peace on Earth. Rowdy men in colourful rags gather outside the city’s nicer homes, demanding to be let in. Some have disguised themselves with mock-fancy outfits that ridicule their less-than-willing hosts, while others have blackened their faces or dressed up as animals. If you try to keep them out, they will shatter your windows, break down your door, and help themselves to food and drink. If instead you grant the rabble access, your costumed guests will drink your best booze and demand a cash “tip” for slurring a noisy song at your family. Welcome to a traditional Christmas, as it was celebrated for over a thousand years: from the last days of Rome, through late-medieval London, to 18th-century New York. No Santa, no Christmas tree, no wreath or holly or mistletoe. And no more sign of the Holy Family than you would have seen at any other season. But unlike modern Halloween, the traditional Christmas involved real intimidation: the costumed petitioners were not small children but lower-class young men; they were already drunk and demanding yet more to drink. How did this annual ritual of clamour and extortion turn into silent night, holy night? Despite centuries of effort by Church authorities, that transformation was not a religious conversion from pagan bacchanal to pious observance. The modern, domestic Christmas is younger than the Industrial Revolution, and like that revolution, it was part cause and part consequence of commercial capitalism. From my usual corner of the local Starbucks, I can see customers picking up their drink orders. Sometimes their paper cups have their names written on them in black marker; sometimes the barista has drawn a thick-lined smiley face for a favourite regular. Recently, I’ve begun to see “Merry Christmas” written out on the cup’s empty red background. I was surprised the first time I saw it. This nominally Christian greeting has all but disappeared from national commercial chains, as America becomes more culturally diverse and Americans grow more sensitive to supposed slights. Why, in an age of cross-cultural “Happy Holidays,” are some select few receiving more denominationally specific felicitations with their Yuletide cappuccinos? “Instead of simply boycotting,” said Feuerstein in a video attached to his post, “why don’t we start a movement?” He went into his local Starbucks, ordered a cup of coffee, and told the barista that his name was Merry Christmas. “Guess what, Starbucks — I tricked you into putting Merry Christmas on your cup!” That video has been watched millions of times and shared by hundreds of thousands of sympathetic viewers. Feuerstein’s campaign is just the latest Christmas controversy. It has become an unofficial tradition in America that as the nights grow longer and the temperature drops, there must be a public skirmish in an on-going culture war over the season and its greetings. The central winter holiday has grown either too secular or too exclusionary, either too politically correct or incorrect, and always—always!—far too materialistic. Implicit in the charges is the idea that unsympathetic forces have corrupted our holiday and degraded our longstanding traditions. We have, it is ever contended, lost track of the true meaning of Christmas. But older than most of our modern Christmas traditions is the tradition of fighting over how to celebrate in late December — or whether to celebrate at all. Feuerstein and his many followers seem to believe that a failure to explicitly observe Christmas is an attack on Christianity. But once upon a time, some of the most zealous Christians in America took the opposite position. For the first two centuries of European settlement in New England, writes Nissenbaum, there was no official celebration of Christmas. In fact, the holiday was systematically suppressed by Puritans during the colonial period.… It was actually illegal to celebrate Christmas in Massachusetts between 1659 and 1681. Why such hostility toward Christmas from pious Christians? According to the Puritans, Christmas was not really a Christian holiday at all. It was only in the fourth century that the Church officially decided to observe Christmas on December 25. And this date was chosen not for religious reasons but simply because it happened to mark the approximate arrival of the winter solstice [and the birth of a legendary number of pagan gods], an event that was celebrated long before the advent of Christianity. The Puritans were correct when they pointed out — and they pointed it out often — that Christmas was nothing but a pagan festival covered with a Christian veneer. When you consider how Christmas had been celebrated for over a millennium — with drunken misrule, menace, and open invasion of property — it’s easier to understand the Puritan antipathy to the holiday. But over time, the opponents of this carnival Christmas found that they couldn’t suppress the celebration. Today, “diversity” is a buzzword for the sort of political correctness that Feuerstein contends is the enemy of Christmas. But the only era in which Christmas was even partially suppressed was when a homogeneous population of the pious dominated the culture and the government. As both Europe and America grew more diverse in backgrounds and beliefs, Christmas reasserted itself. The Puritan attempt to ban Christmas was part of a larger campaign to impose a particular understanding of biblical religion on England and America, but it also had a more practical, secular goal: dispersing the crowds that gathered in public to pursue their disorderly version of holiday cheer. In the early 19th century, a different group of rich and powerful men tried to reengineer the holiday for their own social agenda. That their efforts were ultimately so successful has less to do with their specific goals than with how well their invented traditions served the emerging commercial culture of industrial capitalism. In 1975, a small group of Boston artists were seeking an alternative way to celebrate New Year’s Eve, one that avoided the usual emphasis on drunken revelry. Their solution was called First Night, a gathering of performers and public audiences seeking to welcome the New Year without alcohol. The event was a success, and nearby communities soon adopted it. By the end of the 20th century, it had spread to more than 250 North American cities. By 2006, First Night attracted more than a million visitors. Some of the respectable took it upon themselves to fashion an alternative to the traditional Christmas. The Knickerbockers (the name comes from a pseudonym used by the group’s best-known member, Washington Irving) were “a small group of antiquarian-minded New York gentlemen,” who, according to Nissenbaum, “felt that they belonged to a patrician class whose authority was under siege,” especially during the annual winter riots. Like the First Night artists, the Knickerbockers decided that the solution was not to ban the unwanted activity but to offer it some competition. Unlike First Night, the Knickerbockers’ alternative was to celebrate not in public but at home, not among crowds of strangers but rather with immediate family. This attempt to invent a newly domestic Christmas took several forms, but the one that captured the public imagination was the family Christmas that centred around small children, Christmas presents, and a new patron saint of gift giving: Saint Nicholas. Santa had predecessors, most notably the historical Saint Nicholas (known in Dutch as Sinterklaas), but before the 19th century, there was no widespread tradition in America of Christmas gifts for children — in part because our current idea of childhood is itself a recent invention. In pre-modern times, most children were treated as proto- or mini-adults — not yet fully formed but otherwise not essentially different from anyone else. There is some disagreement among historians about parents’ affection and attitudes toward their offspring in the eras of high infant mortality, but if we put aside the historically thorny issue of familial tenderness, we can see that the parental duty, commonly understood, was to prepare children for adulthood as directly as possible. Only in the early period of capitalism, with the rise of a large, commercial middle class, did the notion arise that children should be segregated from the grown-up world of work — and of bacchanalian carousing. Where Western attitudes toward childrearing had previously focused on a conception of the young as little savages who needed to be civilized, the modern bourgeoisie, influenced by the writings of John Locke and Jean-Jacques Rousseau, came to perceive children as fundamentally innocent — a state that needed to be preserved, protected, and celebrated. With the more widespread wealth and increasing privacy brought about by a growing commercial economy, a new divide emerged in the minds of the middle class: a separation between the corrupting public sphere and the protective shelter of the home. The new icon of Santa Claus offered New Yorkers, Americans, and eventually the whole world a figure around whom to ritualise this newfound domesticity and to raise new generations of parents who would come to believe that their childhood memories of Christmas were part of a timeless tradition. Perhaps the very speed and intensity with which those essentially new rituals were claimed as timeless traditions shows how powerful was the need to keep the relationship between family life and a commercial economy hidden from view — to protect children (and adults, too) from understanding something troublesome about the world they were making. As merchants recruited ‘Saint Nick’ to promote their shops and mass-produced products, an antithetical image of Santa’s workshop became well established: one with no sign of machinery or modern production, only hand tools and individual craftsmanship. The presents exchanged on December 25 were overwhelmingly store-bought items; but with price tags removed and wrapping paper applied, they were presented as existing outside the commercial nexus. The meaning of Christmas, according to the tree-centred ritual, lies not in material gain but in gratitude and generosity. Our current holiday rituals can be seen, then, as a dance between capitalism and an on-going cultural ambivalence to commerce. The world of economic production and exchange produces a need to escape our awareness of the marketplace — and the market itself meets that demand. If we need that annual hiatus to be more spiritual, less materialistic, more familial, and less anonymous, the commercial culture will adapt, even with seemingly non-commercial solutions. Those who want to celebrate the winter solstice as the birth of their saviour[s] have centuries of tradition behind them. But that has never been the way most people celebrated the season, no matter what our selective memory may suggest. Drunken revelry in the streets, now confined to New Year’s Eve, is a much older tradition, and one the Church sought to counter with its celebration of the Nativity. A religious Christmas may be more peaceful, more admirable, and certainly more high-minded, but in the appeal to tradition, it loses out to older and more popular forms of low-minded merrymaking. Where religious authorities tried and failed to rein in the noise and menace of the solstice season, modern capitalism succeeded, displacing the winter carnival with its own invented tradition: the domestic Christmas, a 19th-century creation merging Christian and pagan symbols in a celebration centred around two other historical innovations: the modern family and modern childhood. For millennia, people have wanted to spend the darkest part of the year celebrating in a way that diverges from the normal rules and routine. In an agricultural age, that meant overindulging in meat and drink. In a rigid social hierarchy, it meant reversing the ranks, making the wealthy serve the poor. In a commercial age, where mom and dad head off to separate jobs while the kids are sent to school, it means spending the holiday together in leisure, practicing a form of mutual generosity that is ritualized to obscure its capitalist origins. As long as the demand continues for an annual hiatus from the normal rules, the market will supply whatever is necessary to mark the season, even when what is required is the impression that we have somehow transcended the commercial world that makes our modern Christmas possible. where this post previously appeared.